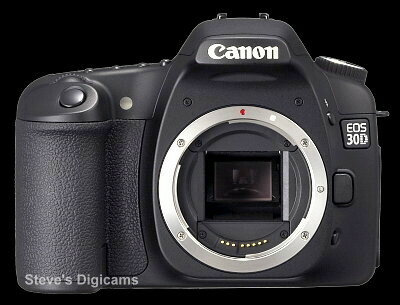 The EOS 30D Digital SLR is the much anticipated update to Canon's popular EOS 20D. It takes the same 8.2-megapixel APS-C size CMOS sensor and mates it to the more powerful DIGIC II Imaging processor for fast 5 fps performance. 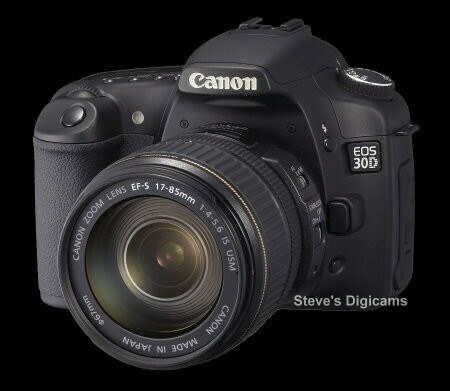 The EOS 30D takes photographers closer to the level of Canon's pro digital SLR line, incorporating features and innovations from the EOS 5D and the EOS-1D Mark II N Digital SLRs, at a fraction of their respective prices. Whether your job is covering a wedding, a hot news story or capturing the fine details of a portrait, the EOS 30D has got you covered. A new spot metering capability that covers approximately 3.5 percent of the viewfinder area at the center while maintaining the 20D's 35-zone metering sensor (raising the EOS 30D's available metering modes to four). Increasing the camera's flexibility and ease of use, the ISO speed can now be set from 100 to 1600 in 1/3 stop increments, rather than full stops (and can be pushed to 3200 with ISO expansion). 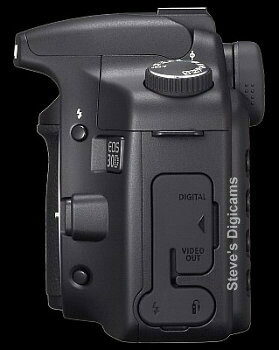 What's more, users can see the ISO setting in the viewfinder while changing it (and not simply on the monitor display as on the EOS 20D model), which in turn permits photographers to keep their eyes on their subject. The EOS 30D continues its predecessor's fast shooting rate of five fps but, thanks to improvements in signal processing algorithms, the burst rate has increased from 23 to 30 consecutive frames in JPEG L/F mode and from 6 to 11 consecutive frames in RAW mode. A single shot AE/AF lock, which retains settings for subsequent shots simply by keeping the shutter release half-pressed after taking the first shot. 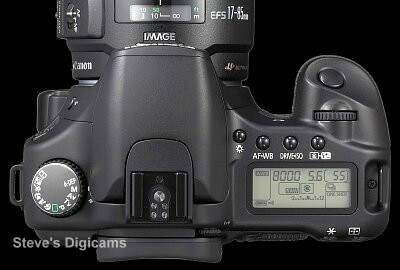 The EOS 30D retains the 9-point Wide-Area AF system, originally introduced on the EOS 20D. This AF system features a diamond-shaped layout with a dual-precision central AF point that provides full cross-type performance with maximum apertures as small as f/5.6, yet achieves up to three times the standard focusing precision when used with EF lenses featuring maximum apertures larger than or equal to f/2.8. A convenient Multi-controller provides fast and easy AF point selection. While using the same 35-zone metering sensor as its predecessor, Canon has added a spot metering capability that covers approximately 3.5 percent of the viewfinder area at the center. As a result, there are now four metering modes offered: Evaluative (set automatically in the Basic Zone modes), partial (approximately 9 percent), center-weighted average and spot. AF-point linked Evaluative metering, E-TTL II autoflash and 12 exposure control modes (11 AE modes plus manual) are unchanged from the EOS 20D. First introduced on the EOS-1D Mark II N and EOS 5D cameras, Picture Style is an improved approach to selecting the presets for sharpening, contrast, saturation and color tone that most closely reflect the needs and intent of the user. Similar to selecting the film type in order to achieve a desired result, the Picture Style feature offers six setting choices - Standard, Portrait, Landscape, Neutral, Faithful and Monochrome - with an additional three user defined settings available. Among the enhancements most immediately noticeable is the large 2.5-inch LCD screen with 230,000-pixel resolution, wide 170-degree viewing angle, and LED-backlight for improved visibility. Like the EOS 5D, the EOS 30D's full-featured INFO screen includes files sizes, a choice of brightness and RGB histograms and AF frame displays. In addition, Quick Review images are now enlargeable making it quicker and easier to check the focus of a shot immediately after taking the shot. You can now access direct print and direct download functions simply by pressing the print/share button on the back of the camera. Further, when connected to a PictBridge or other compatible printer, the user can select paper sizes, cropping, and even some special effects. Expanded paper selection, including a range of fine art paper stocks available in a variety of sizes up to 13 x 19-inches. White Balance: Auto, six presets and Manual color temperature (2800-10,000°K in 100° increments) and can be corrected for blue, amber, magenta or green. 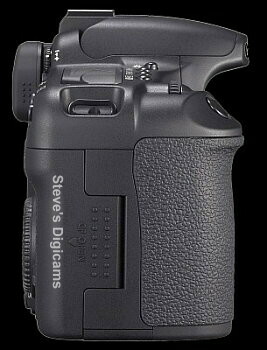 Eye level TTL viewfinder with diopter adjustment, illuminated AF points, depth-of-field preview and detailed information display. Built-in E-TTL II popup flash with red-eye reduction. The EOS 30D and the EOS 20D for comparison. ISO speed Basic Zone modes: ISO 100 - 400 set automatically Creative Zone modes: Equivalent to ISO 100 - 1600 (in 1/3-stop increments), ISO speed can be expanded to ISO 3200. AE lock Auto: Applied in One-Shot AF mode with evaluative metering when focus is achieved. Shutter speeds 1/8000 to 30 sec. (1/3- and 1/2-stop increments), bulb X-sync at 1/250 sec. Continuous High-speed: max. 5 shots per sec., Low-speed: max. 3 shots per sec. 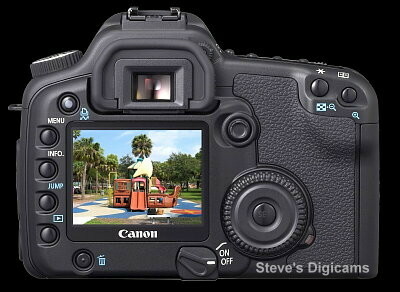 * Based on Canon's testing conditions with a 512MB CF card for high-speed continuous shooting. * Varies depending on the subject, ISO speed, Picture Style, CF card, etc. Highlight warning In the shooting information mode, any overexposed highlight areas with no image information will blink. Protect Single images can be erase-protected or not. Erase One image or all images in the CF card can be erased (except protected images). * Images to be used for wallpaper on the personal computer screen must be JPEG images. Battery One Battery Pack BP-511A, BP-514, BP-511, or BP-512. * AC power can also be supplied with the DC Coupler. 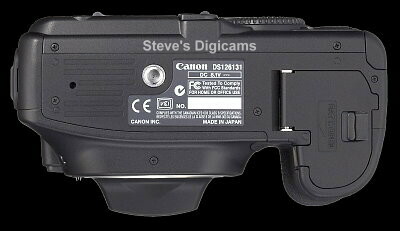 * With Battery Grip BG-E2, size-AA batteries can be used. Power saving Provided. Power turns off after 1, 2, 4, 8, 15, or 30min. Date/Time battery One CR2016 lithium battery. Dimensions (W x H x D) 144 x 105.5 x 73.5mm / 5.7 x 4.2 x 2.9in.